Electric Cars? No. Bicycles? Yes. I was recently quoted by both USA Today and FOX News regarding my take on priority parking for electric vehicles. I argued that American taxpayers give electric car owners tax breaks and credits to buy their vehicles as well as priority parking and special freeway lanes even though there’s no evidence they’ve done anything positive for the environment in return. In fact, the mining, heavy metals, and other side effects of electric car production and operation are likely worse for the environment when compared to traditional gasoline-powered vehicles, and will be for some time according to a National Academies report. If stores and organizations wish to minimize their environmental footprint, then they can give priority access to bicyclers and pedestrians. Congress can do the same. Senate bill 1813 has left committee and will be up for a vote soon. In its current form, it will shrink bicycle and pedestrian support by eliminating dedicated funding for programs such as the broadly successful Safe Routes to School (SRTS) initiative. It will lump other types of pedestrian and bicycle funding into a discretionary budget to be apportioned by state governments. 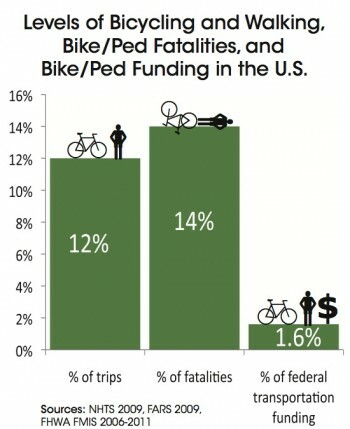 States would be free to divert bicycle and pedestrian funding within their borders to automotive projects. Congress is framing all of these cuts as a way to save money. But if Congress is serious about stabilizing the nation’s balance sheets, they’ll stand up to thirsty car-culture lobbies and back low-cost bicycle and pedestrian improvements that pay durable dividends.